The RAC is Britain’s oldest motoring organisation and an iconic brand on our roads today. 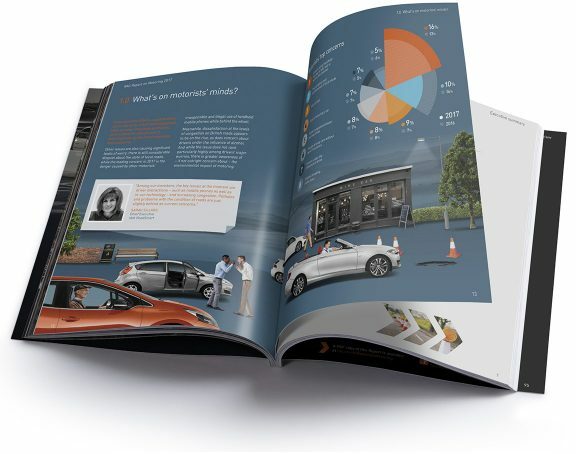 At the heart of RAC’s PR machine is its annual Report On Motoring. We’ve designed and produced this prestigious, corporate publication since 2009. The report is aimed at journalists, broadcasters, policy makers and corporate partners. The brief is to maintain RAC’s position as a leading motoring authority and provide the platform for media conversations about Britain’s roads and drivers. This award-winning Report is the result of an in-depth survey of over 1,700 motorists. We support the RAC with our own photo library, shot over the course of each year. The design works for print as well as an interactive digital version. The layout has call out facts, stats and quotes, so it’s easy to browse or read in-depth. Custom infographics bring the insights to life and can be shared through social media channels, by the business, across the year. The RAC Report on Motoring is the UK’s only ongoing representative study of driver opinion which was first published in 1988. It has a far reaching influence on the RAC’s status as a leading campaigner for better roads, safer and more affordable motoring for everyone in the UK. The Report content is used throughout the year to inform the RAC’s comments, and campaign strategy and generates a multi-million pound media value. It is eagerly anticipated and widely referred to by industry stakeholders and the media.